Check out some of our favorite memories of Ashley Tisdale through the years! We fell in love with Ashley when she played the smart, talented and sweet Maddie Fitzpatrick in The Suite Life of Zach & Cody. Maddie worked at the candy counter at the Tipton Hotel and babysat Zack and Cody. Ashley played Sharpay Evans who is the queen of East High's theater department in High School Musical 1-3. Sharpay was spoiled and demanding always wanted the best tings in life. Her favorite color is pink, so of course she had a pink convertible, pink golf cart and pink golf balls. Ashley debut album was released in 2007 by Warner Bros. Records. Headstrong was a dance-pop R&B album that showed Ashley's own personality. The lead single was "be Good To Me." SHARPAY’S FABULOUS ADVENTURE FROM WALT DISNEY STUDIOS HOME ENTERTAINMENT AVAILABLE ON DVD & BLU-RAY APRIL 19TH! Fave Ashley Tisdale Role? Vote! Sharpay in High School Musical. 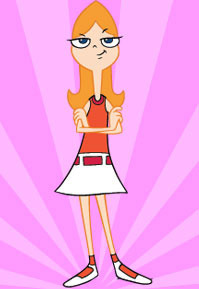 Candace in Phineas and Ferb. Maddie from The Suite Life.